Forty-plus years of living in Paris, first as a student then as the wife of a well-known banker and historian, have given Harriet Welty Rochefort the ability to look at both sides of the French-American cultural divide with a sharp analysis that’s both trenchant and humorous. She’s published three books that I think of as cultural dictionaries. In them, she translates French culture in a way Americans can understand, even if we sometimes can’t quite comprehend. The French are different from us Americans (and from Germans, the only other European culture I know well enough to judge). But at the same time they’re much like us. Or we’re like them. Harriet’s focus is the differences wrapped within the similarities. There are plenty of both, and they seem pretty well matched in plusses and minuses. Bingo. And the same goes for her American husband. We stand out, and we need to be conscious of that, since we’re guests in their home. I watch that newscast, too (it’s on the web at France2.fr. Be prepared to follow quick French) and it does seem to focus on the negatives of the day, but that’s pretty much TV news everywhere these days. 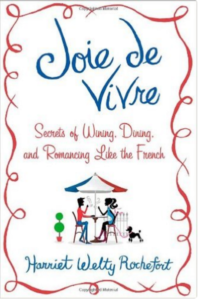 Joie de Vivre is a charming book, informative at the same time it entertains. I give it five stars. If you’re already a Francophile you’ll enjoy it immensely; if you’re just thinking about a visit you should consider it as well. Thomas Dunne Books. Kindle edition $11.99, hardcover $19.17. I reviewed the Kindle edition, which I purchased. Its Amazon page is here.